Gina Graydon knows the last thing she’ll attract on her holiday in France is an eligible bachelor. Tall, outspoken, and with a weakness for laughing at the wrong moment, not to mention being much too occupied with reading gothic romances, Gina decides she’d rather live in her fictional world. Besides, the only man who pays attention to her at the resort hotel happens to be her father’s worst enemy. And that is far from romantic. Reading in a secluded garden, and dreaming about the perfect kiss, all keep Gina much too busy to consider Mr. Edmund Donaldson any sort of hero. 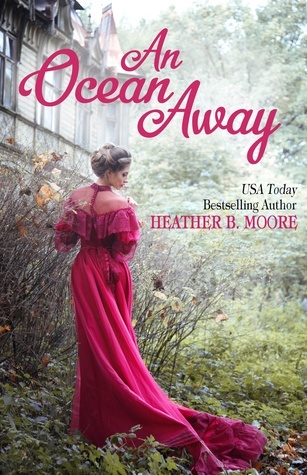 AN OCEAN AWAY was originally published in the Timeless Romance Anthology: European Collection, and it's a companion novella to the USA Today bestselling romance HEART OF THE OCEAN. This novella is the perfect little bite of sweetness. It begins with a girl who loves romance books and who escapes to the garden to read and dream. That right there was enough to make me love Gina. Is the cover so pretty? I love it. Edmund sees Gina in the garden and can't help but be intrigued by her. He enters the garden hoping to meet her and learn more about her. It's all so very romantic and sweet! I loved my minutes immersed in this book. It made my heart hum with happiness. -I received a copy of this book from the author. I was under no obligation to review and all opinions expressed are my own.